LMC-3000 is a modern low-speed bench-top centrifuge designed for operation with microtest plates and centrifuge tubes up to 50 ml. This device is widely used in biomedical profile laboratories. Wide choice of accessory rotors. Is it possible to turn off forced breaking? Yes, this function has been introduced from May 2015. By default, centrifuge applies force to stop the rotor. To toggle between forced braking and free braking, press Open key and hold it for 8 s. Using ▼ and ▲ TIME keys, choose between BRAKE OFF (free braking) and BRAKE ON (forced braking). Press and hold Open key for 8 s to exit. Is it possible to use glass tubes in LMC-3000? Yes, but only high quality glass tubes for centrifugation, otherwise we do not recommend to use glass tubes. Swing-out rotor for conical bottom centrifuge tube. Aluminium buckets. Swing-out rotor for conical bottom centrifuge tube. Plastic buckets (POM Kocetal). Swing-out rotor for round bottom centrifuge tube. Swing-out rotor for conical bottom centrifuge tube. 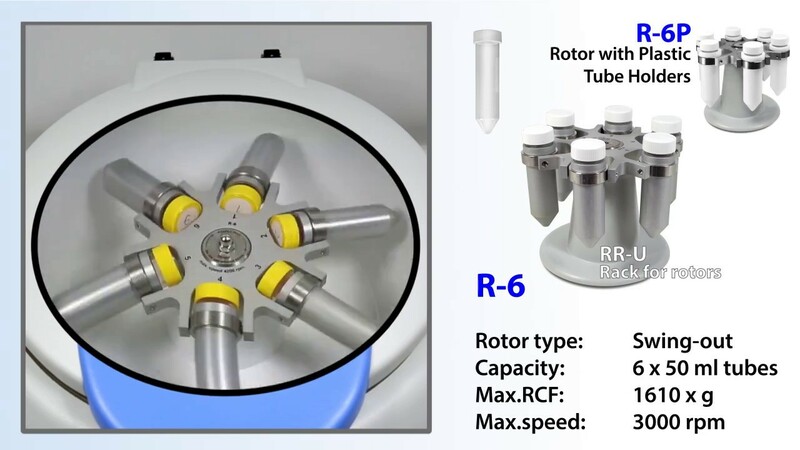 Swing-out rotor for standard 96-well microtitre plates, skirted PCR plates, deepwell plates up to 45mm.